When new parents are expecting their first child, they often feel anxiety and have some reservations about what the future holds: will they be good parents? Will they know what to do if their child gets sick? Will their child be healthy? What will they be like as adults? And then there are the myriad of decisions facing parents, starting with that initial moment of discovering that you are pregnant, from choosing an obstetrician to the future health of your child. Will you vaccinate? What school will they go to? Should you use cloth or disposable diapers? Epidural or natural childbirth? And from the choosing of the baby’s name to whether or not you’re going to breastfeed, you can be sure that you will receive a lot of free advice from others. When we found out we were expecting our first child, I was shocked. I took the pregnancy test at 5:30 a.m. one morning prior to heading off to work. When it came back positive, I woke my husband up, crying. Then I went to work and had a patient who ended up hemorrhaging. When the crisis passed, I ended up sobbing to my manager, “She was bleeding and I’m … prrreeeegegegegnant”. But the tears quickly passed into nausea and a lot of KFC mashed potatoes (I think that’s about all I ate for the first trimester), and as the days passed we became more and more excited about the little man who would soon join our life. We faced a lot of the issues and decisions that new parents face, and some doubts, but all in all, I felt very prepared that I could handle the health issues that our child faced. After all, I was the oldest of 5 kids and I was a nurse. Kids got sick, you helped them get better. I really wasn’t worried. So I did everything that I knew would help my child be well. We kept all our well-baby visits. We vaccinated. Being the awesome mom that I was, I gave Tylenol not only AFTER vaccination, but also BEFORE vaccination, to help ease the pain of the shots. When my little guy was still underweight at 4 months of age, we started giving him solid foods, including rice cereal and pureed apples and bananas. And after he lost all of his language by 18 months, I also followed the nurse practitioner’s advice to “just wait, boys talk later” and proceeded to give him several more vaccinations that day, along with a healthy dose of Tylenol every 6 hours. Was what I did wrong? Not necessarily. I did what I thought was best. Would I do it the same way again? Definitely not. Over the years since then, I’ve learned things that I didn’t think to research before. For example, Tylenol has a history of being dispensed almost like it’s candy. “For anything that ails you, take a Tylenol!” In the medical profession, we all know that Tylenol can cause liver damage when taken at high doses, but as long as you keep the amount taken daily under 4 grams, Tylenol is great for aches and fever reduction. Even pregnant women are told that they can safely take Tylenol. Now, however, Tylenol has been linked with everything from asthma to autism. For me, one of the big downsides to Tylenol is its impact on our liver: not just in the toxic doses that we avoid, but even in the small doses that we give our children when they teethe or after vaccination. Glutathione is one of the most important antioxidants in our body, but one we don’t hear much about (I don’t recall ever hearing about glutathione prior to my son being diagnosed with autism). Glutathione is made in our bodies from certain amino acids. All cells in the human body are capable of making glutathione, but LIVER synthesis of glutathione has been shown in studies to be essential. Mice who were genetically programmed not to produce glutathione in the liver died. Glutathione is essential for detoxification of our body. Sounds important? It is. But what does glutathione have to do with Tylenol? OK, so now you’ve done your research and you realize that Tylenol may not be the best option for your family. Now what? When the next fever strikes, what can you do? What about your headache, muscle aches, or cramps? That is where essential oils come in. Simply put, essential oils were medicine before there was medicine. In ancient times, people relied on essential oils to help them heal from disease, to ward off infection, and for the wonderful scents they emit. Oils are mentioned in many different ancient documents, including the Bible and ancient Egyptian hieroglyphics. An essential oil is an aromatic liquid that is found in many plants. It is the “regenerating, oxygenating, and immune defense property” of the plant. (“Quick Reference Guide for Using Essential Oils”, by Connie and Alan Higley) Essential oils easily penetrate the skin and are quickly absorbed by the body and are capable of penetrating cell walls. Essential oils that contain substances known as sesquiterpenes are also capable of penetrating the blood-brain barrier. Essential oils are antioxidants, antibacterial, anticancerous, antifungal, anti-infectious, antimicrobial, antitumor, antiparasitic, antiviral and antiseptic. They detoxify and balance the body. They help promote physical and emotional well-being. And besides all that, they also smell wonderful! When using essential oils, it is very important that they are distilled using a very careful technique. You can buy essential oils anywhere, from the health food store to the corner gas station, but the oils will likely not be of good quality and may even be harmful to you. If you look on the back of a bottle of essential oil and see the warning “Not for internal use”, you know that it is not a good quality essential oil. Make sure that you choose oils that are pure and therapeutic-grade. So, then, what should I do if my child develops a fever and I’m used to reaching for the Tylenol? First, read my post here about the important role that fevers play in healing. OK, so now that you have a fever that needs to come down, what should you do? When you begin using essential oils, a great tool to have is an essential oil pocket reference. I have two (actually three right now, because I have the large essential oil desk reference that my son’s physical therapist lent me). The two that I own are “Essential Oils Pocket Reference, Sixth Edition” and “Quick Reference Guide for Using Essential Oils”, by Connie and Alan Higley. 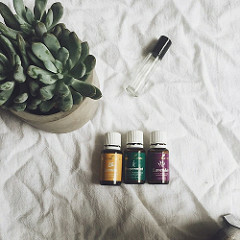 Inside, they reference dozens of different oils and oil blends, suggest different oils that may be helpful for different ailments, and give many suggestions on the safe use of essential oils and techniques. Without this information, it is very difficult to use essential oils safely and effectively. There are a couple of different recommended oils, but one that you frequently see used is peppermint. Peppermint is a very versatile oil that can be taken internally, used topically, and can be inhaled. I was feeling very nauseous this evening, and inhaling peppermint essential oil was enough to help settle my stomach. Peppermint is anti-inflammatory, pain relieving, antibacterial, antiviral, and a digestive stimulant. It also can help with attention, performance and focus when inhaled during mental tasks. In a double-blind, placebo-controlled study done by the University of Kiel, peppermint was found to lessen headache pain as well. If you have more essential oils on hand, such as lavender and frankincense, you can try some of these blends recommended here: How to Reduce Kid’s Fevers Naturally With Essential Oils . Oils can also be applied diluted to the forehead, temples and back of the neck. With cold and flu season coming up again, it’s good to get prepared now and have a plan for when symptoms arise. Even now, you can find that essential oils can help with insect stings, scraped knees and other casualties of summer fun. I know that making the change to a healthier way of life takes some time to adjust, but it is worth it. Prior to eating healthier and following a less toxic way of life, my boys were usually sick the entire winter from September to April. One year it seemed like we went from a stomach bug to the flu to croup and then circled back around continuously until May. The last two winters that we have followed a GAPS protocol, we have been healthier as a family than we ever have before. Last winter, I didn’t have to call in to work once for sick kids. Now, with using essential oils, I have one more thing in my arsenal to help my kids stay healthy!